Keith Carlson helps nurses create fulfilling and healthy careers as a Board Certified Nurse Coach, and has been a nurse since 1996. Carlson also writes “Digital Doorway,” an award-winning nursing blog, and is co-host of RNFM Radio in addition to hosting his own nursing career podcast, The Nurse Keith Show. Aspiring Registered Nurses must graduate from an accredited nursing program, which are available online, as well as on university and college campuses. Students have a number of educational options from which to choose, ranging from certificate to graduate-level programs, as well as alternative paths for those who already hold a degree in a subject other than nursing. The purpose of this page is to assist prospective students in navigating admission requirements and finding the right degree program in their efforts to become a Registered Nurse. Prospective students interested in studying a career that allows them to work closely with patients to improve their overall health and quality of life may benefit from enrolling in an RN degree program. The medical field is constantly evolving and growing to meet the demand of students. 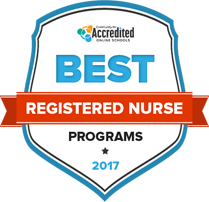 To help students find the best RN program for them, we have ranked schools all over the country based on criteria such as cost, graduation rates and resources available to them. Explore the top RN programs for 2017 in the list below. New York University’s most-popular programs at the NYU Rory Meyers College of Nursing are the 15-month accelerated and traditional four-year degree programs. Undergraduate academic programs include an RN-to-BS, transfer degree, and double major options. Students seeking the accelerated BSN degree must complete prerequisites in anatomy and physiology nutrition, microbiology, developmental psychology, statistics, and chemistry (including lab). NYU’s Global Public Health/Nursing double major combines a nursing BS curriculum with a focus on community and global health. Graduate programs include a BS/MS, MS/MPH, DNP and PhD. In addition to the degrees, there are 10 advanced certificate programs at the university. Founded in Allentown in 1867 as a private, women’s liberal arts college, Cedar Crest College currently serves 1,885 at its 84-acre suburban campus. Nursing programs include a BSN degree and BSN-completion program for transitioning registered nurses. Students can opt for a minor or double major in gerontology, healthcare management, or school nursing. The online Master of Science in Nursing program offers tracks leading to specialties as a nurse administrator or nurse educator. The School Nurse Certification Program (17-18 credits) can be completed on campus or online in as little as 18 months. Loyola University Chicago offers comprehensive degree programs with an emphasis on the Jesuit Catholic tradition. The Marcella Niehoff School of Nursing (SON) offers a Bachelor of Science in Nursing (BSN) and the Accelerated BSN (ABSN) at the undergraduate level leading to NCLEX examination. Other undergraduate offerings include a wholly online RN-BSN degree and Bachelor of Science in Health Systems Management (non-nursing). Graduate students with an RN license and BSN can complete advanced degrees with a Nurse Practitioner or Clinical Nurse Specialist designation. The school’s RN-MSN is open to applicants holding an associate degree. Shenandoah University, located an hour away from Washington D.C., was founded in 1875 in Winchester, VA. In 2016, freshmen students were awarded more than a total of $6 million in financial aid. Shenandoah’s Bachelor of Science in Nursing is a traditional, four-year degree program offered on the Winchester Main Campus. All nursing students are grounded in technology through the university’s iMLearning program. Classes are small and include studies in emergency preparedness and disaster relief nursing. At the end of the freshman year, nursing students must attain a minimum score of 65% on the Essential Academic Skills Test (TEAS) to advance to the second year. Founded in 1955 by the Sisters of St. Dominic, Molloy College serves more than 4,000 students and has witnessed a 26 percent increase in undergraduate enrollment since 2005. Today the college offers nursing students a choice of bachelor’s degrees, dual degrees, master’s and doctoral degree programs. Undergraduate nursing students must complete a one-on-one practicum and other clinical experiences. The RN/Dual Degree Program (DDP) is an accelerated program that allows students to take both undergraduate and graduate courses, culminating in a master’s degree. All students are invited to First Friday brown-bag nursing research seminars every month. Ursuline College was founded in 1871 by the Ursuline Sisters of Cleveland. Today’s 1,500 students choose from over 30 undergraduate and 10 graduate programs at the college. The Breen School of Nursing was created in 1975. It offers a RN-to-BSN program, a second degree program and an accelerated, 15-month BSN degree. It has recently launched its Three-Year BSN Program, open to high school graduates with a minimum GPA of 3.0 and ACT of 24 or SAT of 1110 (M+CR). Graduate students can enroll in Master of Science in Nursing (MSN) or Doctor of Nursing Practice (DNP) at Ursuline. Founded in 1947, Bethel College-Indiana, is an Missionary Church evangelical institution. It currently serves 1,650 traditional and graduate students. School of Nursing offers programs that place bachelor-degree students in clinical experiences one year before they typically begin at other colleges and universities. Students can pursue a 72-hour Associate Degree in Nursing (ADN), a four-year Bachelor of Science in Nursing (BSN), or Master of Science in Nursing (MSN) with tracks for educators or administrators. Working nurses can undertake a RN - BSN Completion Program in 20-month plan (one class weekly) or accelerated 12-month option (meets twice a week). Union University, established in Jackson in 1823, is the oldest American institution affiliated with the Southern Baptist Convention. Its 3,500 students pursue more than 100 programs of study. Students at the nursing school undertake clinical experiences at the Center for Excellence in Health Care Practice and all students have the opportunity to serve on short, international missions. Undergraduates can pursue a traditional BSN degree or a LPN-BSN program. At the graduate level, Union offers a Master of Science in Nursing and a Doctor of Nursing Practice. The university also has a First Step to BSN Program for students with no prior college experience. Founded as a Catholic women’s college in 1924, Nazareth College today is a co-educational, religiously independent institution serving 2,800 students. The nursing school offers a BS in Nursing, LPN to BS in Nursing, RN to BS in Nursing, and accelerated Weekend RN to BS degree. Unique to the program are overseas nursing service programs in Belize and Finland. The Finland program qualifies students for European Union nursing licensure in addition to their four-year American nursing degree. Agreements with more than 90 institutions give Rochester-based students a wide choice of facilities, populations and clinical experiences. University of Rochester School of Nursing, founded in 1925, was one of the nation’s first institutions to offer a diploma of nursing. Its master of science degree program was launched in 1951. In 1979, its PhD program became one of the first 15 nursing doctoral programs in the United States. Today’s nurse education programs are based on a “patient-first” philosophy. Students can choose from Rochester’s Accelerated Bachelor's Program for Non-Nurses, Accelerated Master's Program for Non-Nurses, RN-to-BS, RN-to-BS-to-MS, nurse practitioner degrees, Doctor of Nursing Practice, or post-master's certificate programs. Online offerings include the Family Psych Mental Health Nurse Practitioner program, Care Manager Education program, and RN First Assistant program.